A white cloud is rising over this part of Mosul. We’re at a warehouse inside the Mosul city limits, just a few miles from the front lines. Trucks are parked out front, but I can barely see them through the white haze. Our eyes are burning from it. People are coughing because of it. But everyone is thrilled by it. There are other kinds of clouds here, too. Black clouds dot the city skyline—signs of fierce fighting, car bombs, and suicide vests. But here, in this finally-free neighborhood of Mosul, you are creating a different kind of cloud. The cloud is baking flour, and you just helped send hundreds of tons of it to people in dire need. People clapped and cheered when the driver unfastened the metal lock and jerked trailer doors open. The whole community formed a line from inside the truck, across the yard, and into the warehouse and passed flour and bags of canned goods and other essentials so quickly and efficiently from person-to-person, the work was over in less than an hour. Young men were dusted ghost-white from all the carrying, counting, delivering. Despite everything—despite the draconian rule of ISIS, the terrors of war all around them, and now having no access to food—the community was hardworking and selfless. The flour and other aid is piled in neat rows and distributed according to an official registry, with widows and large families getting priority. Thank you for sending truck after truck of hope to families who need it most! More stories from inside Mosul coming soon. 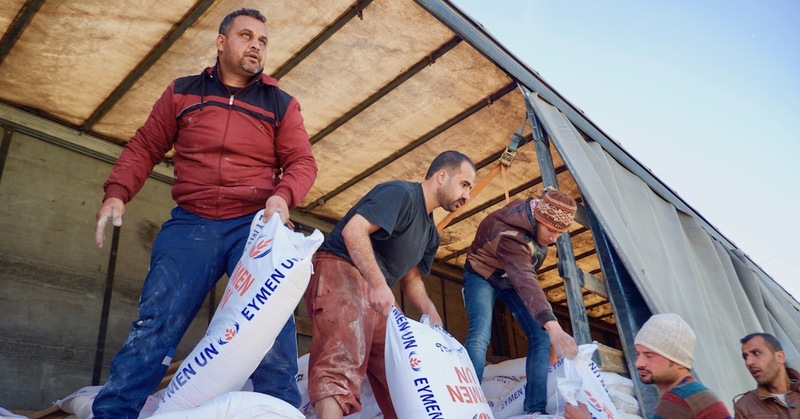 Send emergency relief to people who were just liberated from ISIS. Give today.